When Octavian Augustus (Gaius Octavius) in 29 BC, returned from Egypt to Rome, his power was complete. He was at the head of a huge Roman army which were commanded by generals loyal to him. Octavian’s main problem was how to reign, and that the public does not see him as an autocrat, since this was the reason why Julius Caesar lost his life. That’s why Octavian kept all Republican functions; candidates were still competing for public offices, but only for those which were loyal to him. The Senate continued to make decisions, but only those that suited to Octavian. He had never declared that he transformed the Roman Republic into the Empire, so there is no official beginning of the Roman Empire. Most often, the beginning of the Roman Empire dates from the 27 BC, because Octavian became an Emperor that year. He took over military command in all the peripheral provinces – Hispania, Gaul, Syria … and in those areas was concentrated the main part of the Roman legions, which further increased their strength. Octavian reined his provinces (as Pompey) through his assistants (legions) because he did not want to leave Rome until he fully ensured his control. The territory of Egypt has not been turned into the province; it became private property of Octavian. That same year the Senate awarded Octavian the title Augustus (divine, devoted). This title did not give any additional power to him, but it is significant because of semi-divine name, which increased his greatness. In 23 BC, the Senate awarded him two additional authorities that contributed to his political power. His Imperium had been expanded to the whole Roman territory, and he had taken over the functions of the plebeian Tribune. He marked himself as the protector of the common people. The most common title which Octavian used was that of the Princeps. This was an old republican title which had senior senator and former Consul who had the first right to give speech in the Senate. This is the reason why the rule of Octavian Augustus was called the Principate. The long reign from 27 BC to 14 AD enabled Octavian Augustus to establish a complete autocracy. He ensure the payment from the state budget for the soldiers whose military service lasted for 20 years, and with this he secured the loyalty of the military state, and not with the individual officers. Strong and loyal army helped Octavian to expand and secure the borders of the Roman Empire on natural boundaries – the Rhine and Danube. Augustus founded Praetorian Guard which was stationed in Rome. Guard was consisted of about 9.000 soldiers, which had to be Italians. Loyalty was ensured through a better payment than regular soldiers had, and they served as a personal Augustus guard and a police in Rome. In the future they played a major role in bringing some Emperors to the throne. Augustus has taken the role of Pontifex Maximus – the high priest. One of his first decisions, which he made as Pontifex Maximus was the appointment of Julius Caesar as a deity. He even built a temple dedicated to the “Divine Julius”. Octavian proclaimed himself “Divi Filius” (Son of the God), even though he was adopted son of Julius Caesar, but this served him as a little trick which he used to make people think that even though he was not a deity, he can become one. For the same reason he supported the construction of temples dedicated to Rome and Augustus, and in this way he suggested to public that the rulers should be worshiped. In this way, little by little, he created a cult of personality, and after death he was turned into a deity, and this served as a good example to many later Emperors. 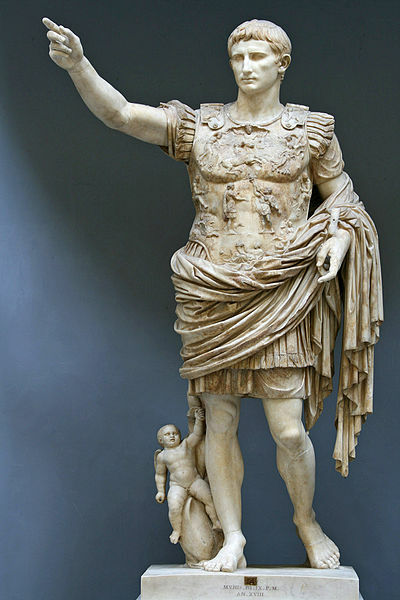 Later years of the Augustus reign brought great prosperity to Rome, because wars that drained the country were ended and therefore Rome started to enjoy the security which led to great cultural creativity. Usually this period in Rome is called the Pax Romana (Roman Peace). August introduced many Laws in favor of the Roman family. It is possible that he was driven to make such moves by huge losses in the total population during the many civil wars in the recent past. He passed the example the Law that included many privileges for fathers who have three or more children; also he issued a Law that strictly punished adulterers.